There are several components to every cat fountain, the most obvious of which are the center pieces or ‘pump covers’ and the fountain bowls. 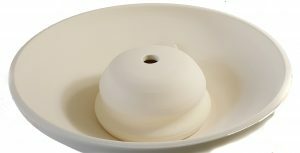 How those are combined – that is, which bowl gets what center piece, is the subject of this article. 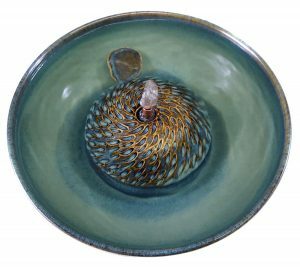 There are several factors that must be taken into consideration when matching up a cat fountain bowl with the center piece, both practical as well as aesthetic. The first attribute we look at is size – are they a good fit that leaves ample room for the cat to easily drink from the bowl? 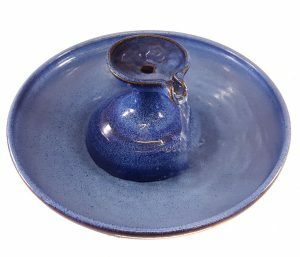 With the ‘bubble-up’ or up-flow fountains this is not so critical as any cat can easily drink from the bowl as well as the spout of water. Nevertheless we don’t want the combination to look or feel cramped. There should be nothing off-putting. On the contrary, the fountain should be appealing – inviting. 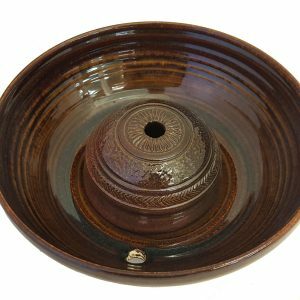 With all of the many stream designs the fit really matters and we need to be sure that there is enough room between the center piece and the bowl rim for easy access. Some cats will want to drink from the stream, some from the bowl so there needs to be plenty of room for the cat to fit his head in there. Another consideration with the stream type of designs is the distance from the point from which the water falls to the water in the bowl. If the distance is too little what’s the point? If too long a stream there may be splash – something we check for and guard against assiduously. On the aesthetic side, does the center piece harmonize with the bowl? This can be a little esoteric and not something easily taught though everyone in our sh op who works with matching center pieces with bowls gets it. Then there are the intangibles requiring a more subtle sense of appreciation. In the Maltese Cross fountain above left, both components have throwing lines which creates a harmony. But more, there is a harmony between the rim of the bowl and the rim of the Iron Cross, as well as between the slopes of the cross and of the sides of the bowl. It is not something you would see exactly, unless you analyze it, but it is something you sense. There is a sweetness about the combination. 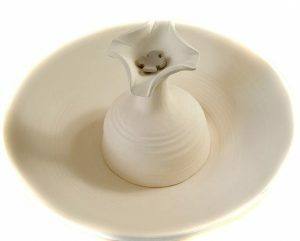 Similarly with this dome center piece and the bowl it is in, (below). Hard to say exactly what it is but there is a palpable harmony between them. Apart from being well-matched in width and height, there is a quality to each of the components that invites the company of the other. Perhaps it is that each has a certain mass to it? Every fountain we make is subject to all these considerations, and more, before we offer it to you. (In a future post we’ll discuss how we select the glazes for each fountain.) We are not just making cat fountains. We are trying to create beauty, and for every one of you who has expressed your appreciation, we are truly grateful.